I see that Scott Speed is following in the footsteps of Montoya and Villeneuve by entering American stock car racing, as expected. He will be driving for Eddie Sharp Racing in the ARCA series, a preparation for the Nextel stock car series. His first race will be in early October. All of Scott's previous experience has been in open wheel racing so this will be a new learning curve for him. He is ready for the challenge, however, and I will be watching his progress with interest. I guess this means I will have to extend my knowledge of the various NASCAR series which, at the moment, seem to me as complicated as the European system of formula this and formula that. And I don't even want to think about the complexities of the karting scene! 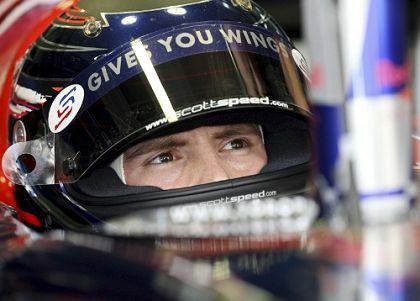 As regular readers will know, I am of the opinion that Scott was a far better F1 driver than anyone realized. This is becoming apparent now that Sebastian Vettel is proving unable to equal Scott's results with the Toro Rosso, let alone beat them. So I would not be surprised if Scott proves to be pretty good at stock cars, although it is a very different form of racing. Montoya's performance in the Nextel Cup series shows that even the acknowledged stars of F1 cannot expect to be kingpin as soon as they enter NASCAR and no doubt Scott will have an even more difficult introduction to the sport. But I think he will do well. He has the determination to succeed and many of the skills he developed in F1 are bound to be relevant in any form of racing. The team he will be driving for, Eddie Sharp Racing, is one of the better teams in ARCA and Scott retains his Red Bull backing, so things augur well for him at present. From there, it is likely that he will make the step up to the Nextel cup, as Montoya has done already. With Jacques Villeneuve racing in the Craftsman truck series, also in preparation for Nextel, there could be three ex-F1 drivers in the top NASCAR series next year. That is bound to raise the profile of NASCAR in other countries and, who knows, we could see the series going the way of Champ Cars and the IRL, with non-American drivers proliferating and eventually dominating the sport. Derek Warwick started out in stock cars in Britain; Dan Gurney and Mario Andretti had a go at them too. So it is not unheard of for F1 drivers to come from that arena - it just hasn't happened for a while. Maybe the future will see other more diverse forms of racing supplying F1 with drivers, rather than the standard route of karts, open wheelers, F3 and GP2. If you can get past the weight and lack of advanced technology, NASCAR can be an extremely fun and challenging series. Not to mention that the same amount of money is being thrown around but a lot of that is going to the drivers instead of the pockets of the already rich. I think he will do great, Ive always been an Dale Jr. fan, and his father for many years before he entered the top series, but it looks like I'll be routing for two this year. Hopefully this will help to get rid of that "Redneck Sport" stereotype that has accompanied the sport since its inception. In fact a large amount of the top drivers are from Cali, Scott just adds to that total. Yup, this can only be good for NASCAR, Dan. I think it departed the old "redneck" image a while back and the new influx of drivers just serves to confirm that fact. Think of the extra viewers that guys like Motoya, Villeneuve and Speed will bring with them and you have a sport that broadens its appeal all the time. There governing body blows the FIA out of the water in terms of fairness and officiating. There rule book is a mile wide, and if you break a rule there is no hearing, your just severely punished and thats that. To prove this, Dale Jr was docked at the beginning of the year for an illegal wing bracket (something the size of a fingertip), it ended up costing him his chance in the chase (playoffs) and he is the most popular driver in the series. As you pointed out that wouldn't have happened to Ferrari. If a governing body is fair in the way it applies the rules, no-one minds. It is when there is apparent preference for one team or driver over another that people get upset. And I agree with you, Dan, that F1 could learn a lot from the way NASCAR is run. rather than quibbling Ferrari over McLaren, etc. And the points system.....points paid for pole, fastest lap, laps led, etc. Did I forget CLOSE finishes, four this year determined by less than a car length! Running in circles is not nearly as boring as an F1 "parade". And, they do road race, remember that fellow Montoya, as a rookie he won the NASCAR road race at Laguna Seca. NASCAR and F1 ..... they are two different worlds, it's good to appreciate BOTH. I agree, Number 38, both have their appeal. In fact, they are not really in competition with each other and to say one is better than the other is a bit meaningless. Whoooa kids - have you not heard of the France dynasty (and I'm not talking about the country)? Bill France and subsequently his son have run NASCAR with an iron fist and are not just like Max, but more like Max and Bernie all wrapped up into one. If you don't play the game their way, you don't play. NASCAR's officiating is not transparent, or even-handed. Neither is its' media coverage. Whenever I'm so bored that I find myself watching NASCAR, I find myself reading or surfing in between the wrecks and the pit stops. It's a shame that they only turn left, and also a shame that they haven't embraced any technology beyond the mid 70's (safety tech not included). I wish they raced on at least 80% road or street courses (not 2) and drove contemporary technologies (like Touring Cars in Europe or even V8's in Oz). NASCAR needs to get with the times to peak my interest. Finally, in my opinion, the drivers that go from F1 to NASCAR are essentially retiring. You can race NASCAR into your 50's - not many sports can boast that sort of longevity without cracking a smirk. Saying it's more about the drivers isn't the same as saying it's more about the driver's TALENT. NASCAR drivers are considered talent, but more in a Hollywood sort of way. "You can race NASCAR into your 50's - not many sports can boast that sort of longevity without cracking a smirk." Golfers have been using the same clubs for a hundred years and no one says they need better technology. Maybe your missing the point of Nascar, the technology they choose to use is because it is accessible to smaller teams and easily policed. Plus there equipment is easily replaced which means more cars finish the race, better racing. Racing is about the competition, I could watch lawn mower racing (and yes they have it) if the racing is fair and close. Yes, they should race on more road tracks, but ovals are spectator friendly. Ovals and road courses require two different chassis types, and this would increase the start up cost of the sport, something they have done a good job of keeping down. I would like to see a second series based purely on road courses. Most of our roads are straight and flat, we are not blessed with your curvy tight little roads. Speaking of road courses, Montoya won at Infinion (Sears Point), although it would be fun to watch these 3500lbs giants go down the corkscrew! the DRIVERS are PUBLIC FRIENDLY! All of us on this site and other F1 sites follow F1 for a reason, we like F1. But that doesn't mean other forms of motorsport are bad, some are different, some are better, it's best if you watch them ALL! But you're right, both forms of motor racing are worth watching. I just don't know as much about NASCAR, so can't really comment much on it. I like both forms of racing and watch both most of the time. I have not missed a formula 1 race this season mostly because of the rookie LH. I think the drama of F1 is more compelling to watch than NASCAR but the racing in NASCAR is certainly more competitive between teams. I will occasionally watch Champ Car but who can keep up with the TV schedule. I wish NASCAR would race on dirt, Tony Stewart has a race at his track called the prelude to the dream that has a bunch of the NASCAR stars in it but is not offically linked to NASCAR and it is a hoot. JPM was in it this past year and came in almost dead last, but I would bet it was his first time to race on an oval dirt track. Dirt track racing, now there's an idea! It has almost died out in Europe but still healthy in the States, I believe. And it does require different skills, perhaps more like rallying techniques I would think. I agree that it must be great to watch.